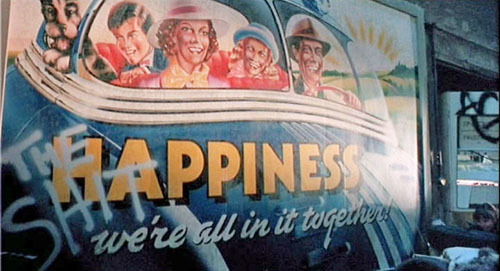 With the general election looming, what better way to herald another five years of Tory rule (probably) than with Terry Gilliam’s surreal dystopian classic, set in a dysfunctional, totalitarian state? 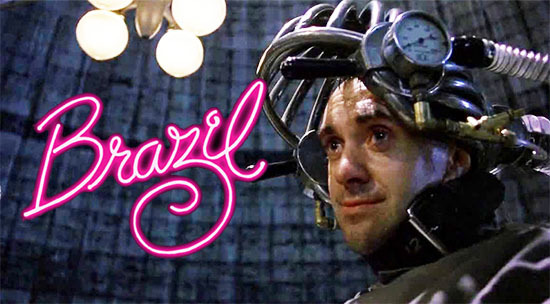 Brazil isn’t actually set in the country from which it takes its title, but rather in a brilliantly realised retro-future ruled over by a monstrous, despotic bureaucracy, with the all-powerful Ministry of Information at its heart. Our ‘hero’, lowly office clerk Sam Lowry (Jonathan Pryce) is just another cog in the machine of the Ministry, despite his overbearing mother’s best efforts. That is until a clerical error leads to a chance encounter with the woman (literally) of his dreams, and sets his repressed grey existence on collision course with his vivid fantasy life. Gilliam’s wildly inventive satire is a comic fantasy of the darkest kind; where prisoners are obliged to pay for the torture they endure at the hands of the state, and the only troubling aspect about a death in custody is the appropriate paperwork not being in order. It’s the ultimate, automated ‘computer says no’ nightmare of your worst imaginings, where convoluted systems are designed to confound. It is also without doubt the only film where Robert De Niro could possibly have a cameo as a black-clad, abseiling, vigilante heating system engineer. Although now over 30 years old, with its stark inequality, extreme narcissism, polluted landscapes, all-pervasive surveillance and paranoia about unspecified ‘terrorists’, Brazil seems to become ever more disturbingly prescient as time goes by. If you haven’t see it before, don’t miss it. If you have, watch it again. Either way you won’t be disappointed.